In the afternoon the clouds was rolling in from the Bay of Biscay. Soon after the the grand beach Concha was in the grey afternoon light. But at 15:35 we still had the sun hidden behind the beach clock. San Sebastián or Donostia is a coastal city and municipality located in the Basque Autonomous Community, Spain. It lies on the coast of the Bay of Biscay, 20 km (12 miles) from the French border. Capital city of Gipuzkoa, the municipality's population is 186,122 (2011), with its metropolitan area reaching 436,500 (2010). 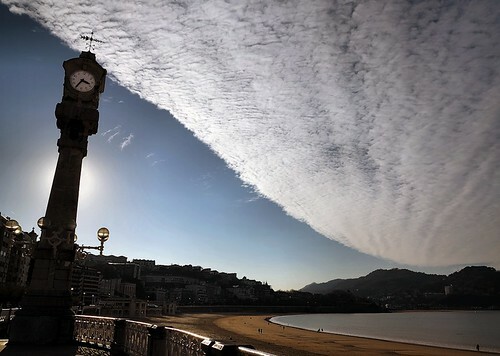 Locals call themselves donostiarra (singular), both in Spanish and Basque.